"Delicious! 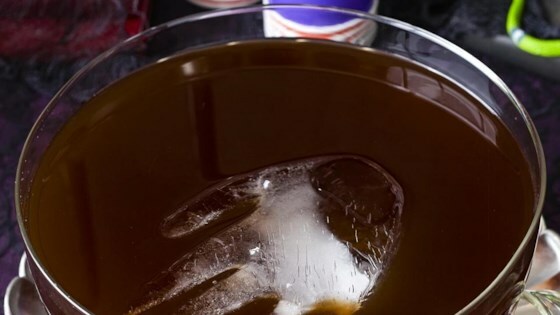 As it is with any Halloween punch, a frozen 'hand' adds just the right spooky touch! The combined colors make a delightfully scary look!" Stir together grape soft drink mix, orange soft drink mix, sugar and water until solids are dissolved. Combine with chilled ginger ale just before serving. Dip the frozen hand briefly in warm water, then peel off the glove. Float the prepared hand in the punch bowl for a ghastly effect. Wrap your dry ice in cheese cloth to prevent a guest from accidentally drinking it. Instead of using water for the hand, make either red or green based Kool Aid and fill the glove. This way your hand is spooky colored rather than clear. I love this punch for classroom Halloween parties served in a black cauldron with dry ice. I double the recipe as everyone has come back for 2nds or even 3rds. Thanks!